sound production. You’ll also learn interview and editing techniques associated with broadcasts. It is a unique, hands-on experience leading to professional-quality outcomes. As a part of the Sound Production team you’ll learn the essentials of sound engineering, and put your new skills into action as you manage the preparation, recording and production of an exciting two-week concert series. A number of these performances will also be broadcast on ABC Classic FM, giving you a unique opportunity to share your work with the whole country! Your tutor, Jim Atkins, has enjoyed a long career in audio production, and will be there to guide you every step of the way. From the minute you arrive at AYO National Music Camp, you’ll experience a whirlwind of new faces, exhilarating challenges. uplifting performances and first encounters with Australia’s best young musicians, composers, music journalists and administrators. With an action packed schedule it’s important to look after our participants. We provide airport transfers, comfortable shared accommodation and three meals per day for every camp attendee. 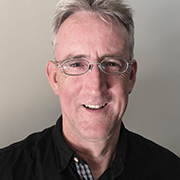 Jim Atkins designs and mixes sound environments for a host of live and recorded situations nationally and internationally. Read more.